Rubber bands are one of the most essential packaging materials we need on a frequent basis. They can be used for a variety of purposes but essentially they are used to tie loose plastic packages. It is hassle free to use them and very easy to tie them to any kind of packaging. To tie small packages or a bundle of items, they can be very handy. Rubber bands are one of the cheapest options to tie packaging goods. They tie tightly around most of the packages and give them a firm hold. The rubber bands we offer are one of the best ways to tie plastic packages, bundle of items or possibly anything that needs an additional layer of protection. They can also be used to wrap around any small boxes to keep them packed and intact. 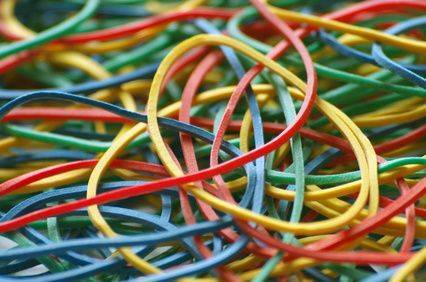 All the rubber bands we offer are of premium quality and don't easily break when highly stretched. Some type of rubber bands breaks while you try to wrap them around packages. Be assured that these are not such type of bands and are highly flexible in nature. 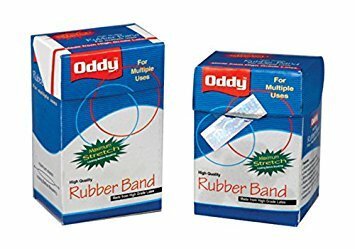 Moreover, they are non-sticky unlike other bands and thus very convenient to use. These Rubber bands are available in multiple colors and look good when used. The bands we provide are also very elastic so we can stretch them to a high extent without breaking them. You can buy rubber band online at affordable prices from DCGPAC. We have always strived to provide you with the best quality products at the lowest prices you can get in the market. These rubber bands are extremely helpful in packaging or tying various items, we avail you these rubber bands online from DCGPAC at extremely low prices. You get the convenience of ordering all the products online from DCGPAC and get them quickly delivered in no time. DCGPAC is recognized as the largest online packaging materials seller in India which has a wide range of products to offer.